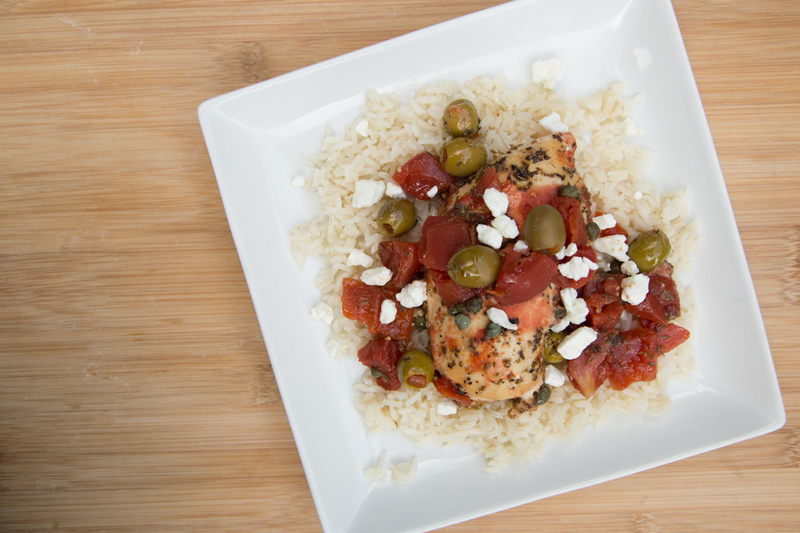 This slow cooker version is a spin from my Greek Chicken Bake. Both recipes are simple and fresh. With slight differences in ingredients. But the core “Greek” ingredients are there – olives, feta, lemon, oregano. My favorite thing about this slow cooker meal – it’s very light and fresh. I can’t wait to hear what you think of this meal! P.S. This is also a fantastic “Freezer to Slow Cooker Meal” – where you freezer the chicken and other ingredients being added to the slow cooker into a plastic baggie or container. Then you can slow cook from frozen for an easy weeknight meal! See other great Freezer to Slow Cooker Meals here. In a small bowl, whisk together the diced tomatoes, chopped olives, olive oil, lemon juice, minced garlic, dried oregano and pepper. Place the chicken breasts in the base of the slow cooker and pour the olive sauce over the top. 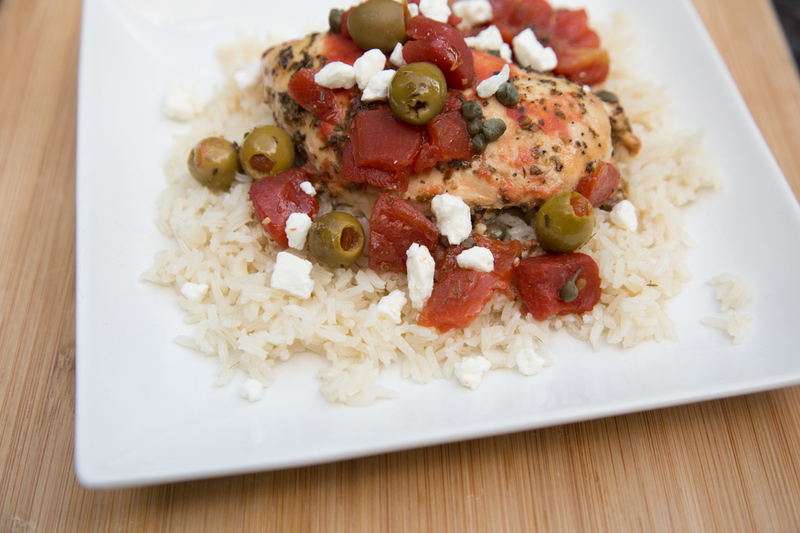 Serve Slow Cooker Greek Chicken with crumbed feta cheese garnish, over rice with salad. This recipe is featured on SouthernPlate.com’s Meal Plan Monday #95. I don’t see tomatoes in the ingredient list? Is it a can of diced tomatoes you add or 3 – 4 chopped romas? Where are the tomatoes in the recipe? I see them in the photo but they are not listed as an ingredient. A can of diced or 2 or 3 fresh Romas diced? I see tomatoes. Is that just an add on after you’ve slow cooked? For the slow cooker Greek Chicken I went over all the ingredients and I don’t see what looks like tomatoes possibly in the picture? In the picture it shows the chicken over a bed of rice but it looks like there’s diced tomatoes or something red in the dish. What is that? The recipe sounds great as is and I plan to try it, but I am a little confused by the picture vs the recipe. It looks like you have tomatoes with the chicken? Or possibly red peppers? But there is no mention of either in the recipe. Just a little confused, but still am going to try the recipe as written! 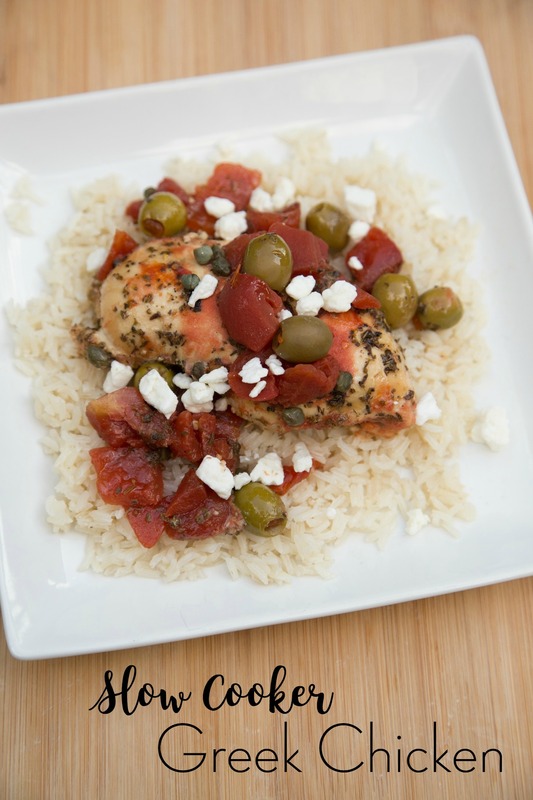 I see what looks like tomatoes or red peppers in the picture, but not mentioned in the recipe….What is the red? It looks in the picture like there are tomatoes in this dish but I do not see any in the recipe?? So is the picture wrong or the recipe – or if neither what are the red things in the pic please?? ?